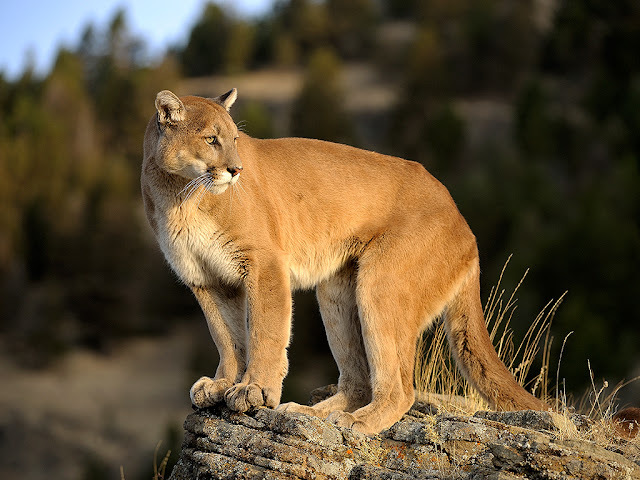 A Mountain Lion was tranquilized and relocated after it caused a stir in a Wyoming city by wandering past an elementary school and through residents' yards. Cheyenne Police said a cougar sighting was reported about 4 a.m. Thursday near Henderson Elementary School, but officials could find no sign of the wild animal when they arrived in the area. Police said further sightings were reported about 9 a.m. in a residential area and police arrived to find the Mountain lion under a tree in a resident's back yard. The area was blocked off by police and Wyoming Game and Fish Department officers arrived in the area just after 10 a.m. The officers were able to corner and tranquilize the big cat after about 30 minutes. The Game and Fish Department posted a video to Facebook showing the mountain lion, a 1-year-old male, being released Thursday afternoon in the Snowy Range, west of Laramie. Regional Wildlife Supervisor Rick King said the mountain lion was likely looking for some territory to claim as his own. "[Young male mountain lions] are known to travel long distances and make some big movements," he told the Wyoming Tribune Eagle, "so he was probably just trying to find his own place to call home."